Returning home from a war without purpose, David searches for his remaining humanity while his family and friends try to reconcile this war-torn veteran with their beloved son, brother, husband and friend. 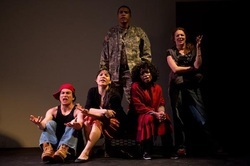 Written by a slam poet turned playwright in the style of Russell Simmons’ Def Poetry and inspired strongly by the choreopoetic style of Ntozake Shange, Goliath provides a tough perspective on war, masculinity and the breaking point of human conscience. Poetic Theater Productions’ award-winning production, Goliath returns to NYC for one night only on the heels of its California tour to Stanford University, UC Berkeley and UC Santa Cruz.